Well - I was sort of nearly right ! I hope you got clearer skies than I did. A high pressure system at this time of year is just going to cap the atmosphere with cloud and fog! What we need in the UK now is some clear, dry north-easterlies ! (for astronomy anyway) With the moon so bright, it is excellant conditions for guiding reindeer and sleighs, but not for seeing faint objects. I'll wait until after Christmas before I have another go. Wirtanen is still with us - now way over to the north going from Auriga to Lynx. It is still a 'fuzzy', but noticably dimmer than it was before Christmas. 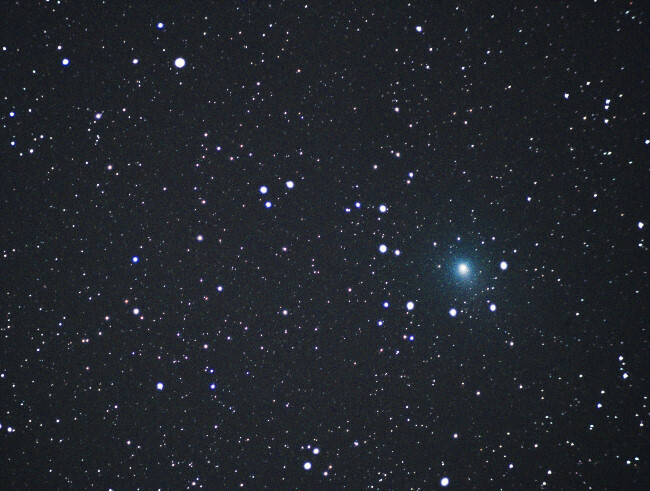 The 'bright' stars in this 60 second shot are 8th magnitude.